How does a person deal with working on a notoriously gory and graphic TV show like Hannibal? Happy dog videos to the rescue! 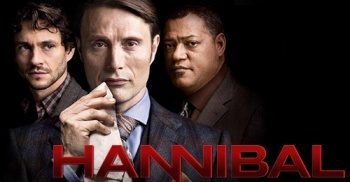 Hannibal, the new psychological horror TV series based on the infamous cannibalistic serial killer Hannibal Lecter, is giving people nightmares and executive producer Bryan Fuller, the man responsible for bringing the psychological crime thriller to the small screen, is no less immune than anyone else. So what do you do when the TV show you have to work on every day gives you nightmares? "I look at dog videos all day to put me in a happy place," says Fuller. Fuller says he tries to counter the depravity of the TV show by "stylizing the violence" and making it "purple and operatic. We're borderline fantasy with what we do on the show." "We want to find what's cool for the episode. We have some stuff coming up that's so over the top ... so the conversations with the directors are , 'This could be ridiculous, so we need to find a way to make it elegant and beautiful at the same time to sort of combat how over the top it is." Even actor Lawrence Fishburne, most famous for his role as Morpheous in The Matrix, told Fuller that "This the second-most disturbing thing I've ever filmed - the first being some stuff from 'Apocalypse Now.'" So there you have it. Happy internet dog videos make the world a better place for everyone. To celebrate, here's a video of Corgi puppies learning how to jump.